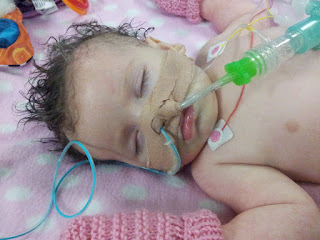 As I type this, we've well and truly entered week 2 of Holly being in hospital. Holly shortly after being admitted to ICU. We've reached a few milestones in that time, but the hard fact is - she's still in hospital. Sue and I have managed to keep people updated on Facebook with daily updates, which has been a Godsend. In the "olden days", we would have had to maintain a list of people to contact and ring round to give them all an update. Now we post on Facebook and watch the "likes" and replies come in, so we can get back to the very necessary job of worrying. For the uninitiated, and to make a reference in this blog, here are the facts from the last 10 days. On Saturday 3 March, we were shopping in B&Q and Holly was feeling a bit aggravated. She was in the Bush Baby carrier and Sue was attempting to feed her as we walked around the lighting section. After a few minutes, Holly went quiet so we thought she'd fallen asleep after having a quick drink. When we got to the car a few minutes later, she was blue and lifeless and her eyes were open, rolling back into her head. I sat in the back with her and called 999, while Sue drove like a woman who's child was about to die, all the way to the local hospital... about 10 minutes away. On the way, Holly eventually did die in my arms. Once we got to the hospital it was a mad rush for the resuscitation unit to bring her back to life, which they eventually did. It was touch and go how well she was going to be, but they were eventually able to give us some optimistic news. The retrieval team from St. Thomas' hospital in Lambeth eventually arrived and whisked Sue, Holly and myself to the PICU ward at Evelina Children's Hospital. Over the next few days, tests were run to determine if she was ill on that Saturday; drugs were given to help her and her temperature was kept low to keep brain function to a minimum and give it time to recover. She's been having intermittent seizures which are to be expected given the "insult" (their words) her brain has been dealt and we just have to wait to see what kind of brain damage she'll be left with. Certain milestones have been reached which we've been told we can view as positive. She had her ventilator removed on Thursday, and she was discharged from ICU on Friday. She's now in the neuro ward in the hospital where the care is not 1 to 1, 24 hours a day, but they are better suited to dealing with children with neurological issues. This week is going to be a very difficult week as the doctors and nurses play around with drug levels to try and find out which ones and which levels work best for Holly. All this time, Sue and I have to endure the unknown - will she cry, will she coo, will she focus on us or objects, how much brain damage is there, what is temporary and what is permanent. It's all a guessing game and it's made all that much harder as the only one who can tell us any answers is Holly, and she's going to take time. Sue and I both feel that our lives are in limbo at the moment and they are. We've received the most incredible support from almost everyone we know. Our friend Mo has given us a bolthole to stay at while we go through this; our other friends have dropped in to see us and Holly and provided us with food and drink to offset the crazy prices at the hospital. The well wishes from people on the internet and stories of other children with epilepsy or similar situations has given us hope that we can help Holly overcome this. I feel like the entire Internet is rooting for us, which is a bit selfish I guess, as I saw 19 other beds in ICU that needed the love and support we were receiving as well. We've received one miracle - having our baby come back to life. We're just hoping that lightening can strike twice and Holly recovers from this as much as is possible. Thank you again to everyone who's got in touch, it's kept us going.